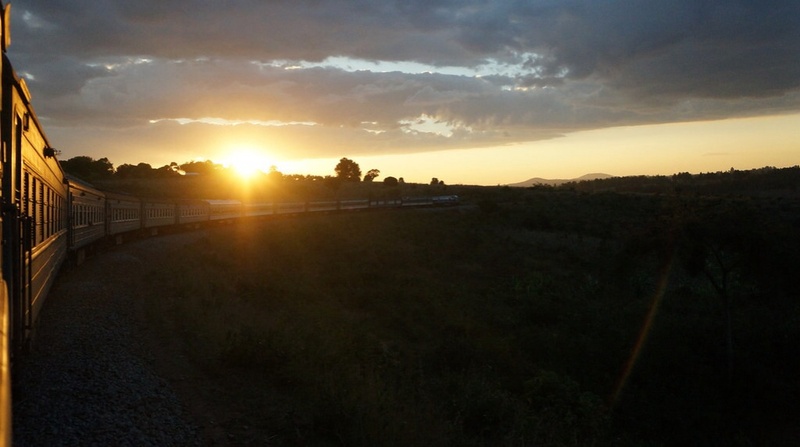 Our departure date from Zanzibar was ultimately determined by the train we had to catch from Dae es Salaam, Tanzania to Kapiri Mposhi, Zambia, the three night, four day Tazara Train that leaves twice a week. If we missed it, our whole route to Cape Town would be thrown out of whack. We made it to the station and it was all aboard. We spent our time reading, playing cards, converting currency, visiting the bar or restaurant carriage, swatting cockroaches and trying not to fall over when doing all of this – it was a pretty bumpy ride. This is Kate converting currency with the smiliest man in Zambia. The scenery was just as you’d imagine – blimmin’ awesome, and sometimes when the train would stop in the middle of the night, we could jump out the carriage door and look at the clearest sky full of one hundred thousand million billion stars. Ahhhhh!!! Nature. Sky. So good. While I’m pleased we took the train ride, I was equally pleased to get off. We arrived in Kapiri Mposhi, took a small bus to Lusaka, spent a dodgy night at the YWCA then hoped on the first bus to Livingstone in the morning. In Livingstone we parked up at a nice backpackers and settled in for a few days. 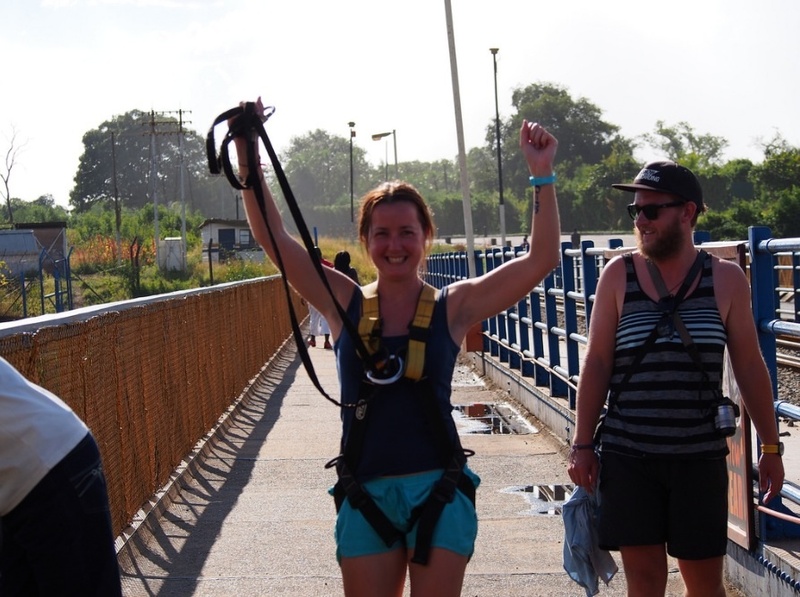 Kate and Sam did a zip line, swing and bungy off a ridiculously high bridge. 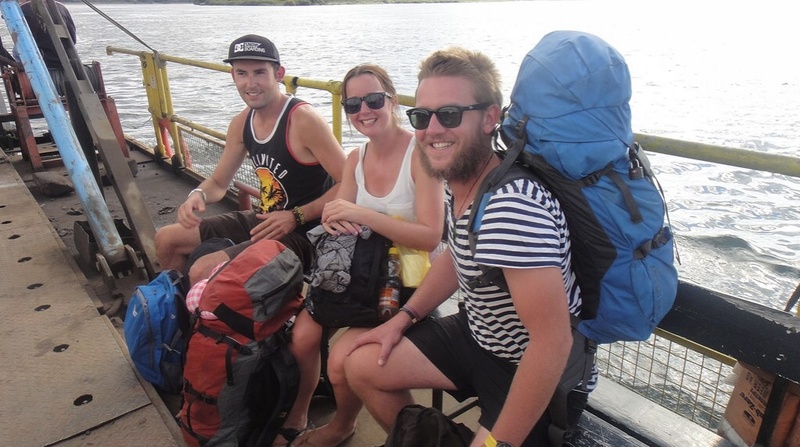 And for Sams’ birthday we took a party boat cruise on the Zambezi river. On top off all of this, we had some nights out in bars with good times and lots of dance floor action. One morning we had a brain explosion of an idea to cross the boarder into Botswana and visit Kasane. So off we went. This is why it’s important to do a bit of research before you venture to a new spot. We just assumed we’d be able to find a cheap backpackers, but after spending the best part of the afternoon looking, we were resigned to paying $98 NZD for two people to sleep in a tent. Granted the tent had beds in it. But still. Kate and I we sharing and we even had a mouse in ours – included in the price. Bonus. $98 might not sound like much for a nights accommodation, but it was way more than we were expecting to pay at this stage of the trip. The next morning we had some yoghurt and museli, caught a ride to the Zimbabwe boarder and then hitched a ride with Marius the South African in his giant truck. Marius smoked about 400 cigarettes, played us his death metal music, bought us a box of beers for the ride, then over and over said, “I can’t believe I have FOUR kiwis in my truck!” in the thickest of thick South African accents. As promised, he dropped us at Victoria Falls where we parked up to plan our next move. While we were there, we played with the pug at the backpackers, ate a crocodile salad and met this guy on the street who was into having his photo taken. All in all – very good.